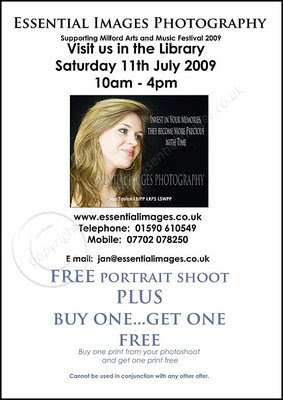 Visit us at Milford on Sea on Saturday 11th July 2009 10am to 4pm for a free portrait shoot PLUS when you buy one print from the shoot you will get another one free! Great opportunity to start buying for Christmas presents! If you can't make it to the Festival and you live within a 20 mile radius of Milford on Sea, Hampshire, email us quoting MAF01 and we will honour the offer until 1st December 2009.